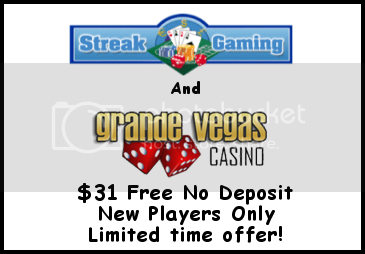 Streak Gaming and Grande Vegas Casino are offering a $31 Free Chip to Grande Vegas. will send you the code for $31 Free. RTG Software and welcomes US players! Once you have claimed your $31 Free, Click the link below to claim for first deposit bonus! Hiya! Just signed up at Grande Vegas Casino and would like to request the bonus. Thanks! hey sgt331! i'm sending you the code now! Any chance of the password fror the grande vegas tournament pls?